Why it makes me happy - there is a strange thing that happens when multiple groups of guys that know each other get together to play golf. Even if you don't know some of the guys, it's like you already do. Afterward, you get together and meet up for a beer or two....or a lemonade. It's just nice....and man fun. Why it makes me happy - it was another GORGEOUS day to be out in the sun....absolutely perfect weather . Mid 70's to 80. Why it makes me happy - I knew two of the guys from a long time ago. It was great to see them . I had never played golf with them so it was nice to spend the time. I played crappy but one of them didn't (see photo to the left) and he got the prestigious trophy. Why it makes me happy - I hadn't done it in a long time. It was fun. I even bowled a 150 which is respectable. Why it makes me happy - the person is good company, wasn't doing anything tonight, and gave me someone to talk to that I knew amidst some strangers. Why it makes me happy - it's a very nice grounding. Let's look at this - breakfast with my unofficial family, golfing with a nice bunch of guys on a gorgeous day, bowling and a birthday party with a good friend in tow. Life is pretty good for the Nutster! Why it makes me happy - I got to see a couple of ladies that I hadn't seen in awhile. It wasn't pleasant to hear what they are going through. The HappyUP!!! is that I got to use my compassion skills. Why it makes me happy - he called me regarding my retirement. We had a great conversation. He is going to get me down to his house outside of San Fran in June. This means we will be taking his boat to somewhere cool for lunch. It will be a fun day. Why it happened - I do e-mail? Why it makes me happy? - I got some good ones today....exceptional. They lifted my spirits on a day when I didn't need them lifted...they cranked the spirits stratospherically. Why it happened - I get hungry? Why it makes me happy - I got to spend some face to face time with an old friend. You'll find that the Happiest of my HappyUP!! !s revolve around meeting with people. This was a rare HappyUP!!! and one of the best. I hadn't seen this person in 4-5 years. We could have spent even more time than we did. Bonus to this HappyUP!!! - speaking with my friend's daughter. My friend rang her up after dinner. I hadn't spoken with this young lady in forever....she's all grown up, through college, and has a cool job working for the governor's office. They do grow up fast! Why it happened - I noticed that she had been "in town"
Why it makes me happy - this friend lives in Paris. I noticed from her blog that she had just been in San Francisco. I shot her an e-mail guilting her for not calling me for lunch. She said she is coming back in July. We'll get that lunch in then. It's something to look forward to. I once heard a phrase that life is about having something to do, someone to love, and something to look forward to. It's something that has always stuck with me. Why it makes me happy - it was a packed house down at the barber shop today. While I can't say that hanging around that crew on a daily basis would do anything but get you in trouble, it's a fun place to drop by once a month. No, you won't find Old Floyd in there clicking the scissors...it's a little younger and edgier crowd. It's not my normal environment....it's good to get out of normal (whatever normal is)_. Why it makes me happy - she is a good gal. I enjoyed working with her. It was nice of her to call. It's not that I need it but it's nice to hear that my conduct and professionalism was appreciated. Why it makes me happy - he's a banjo picker. I showed him one of my guitars. We got done talking. He went back to his house. The weather was PERFECT.....72 degrees with a slight breeze. It was nice to sit out and play .....and write a new tune. Short week? - wait a minute.....every week is a short week for us retired folks. It doesn't mean I can't be happy for those of you who have fewer days to get to until the weekend comes. Why it makes me happy - I nailed it......on a topic I knew virtually nothing about prior to doing a little bit of research. I was able to take a somewhat technical topic (glaciology and the matter in which they melt) and break it into an easily understandable format. Why it makes me happy - I got out there....it's been awhile since I rode. I actually bonked a little bit which made my protein shake on the end of the ride a HappyUP!!! in itself. This is just a step in introducing exercise back into the lifestyle. Why it happened - I was just so attracted to it I couldn't resist. Why it makes me happy - while this wasn't my motive, I now have unlimited access to this pool for the year. The real happy part....helping my buddy out. I know how tackling tough projects on your own can be. We knocked out a bunch of this one today and we will be swimming soon! Good bye golfer tan! 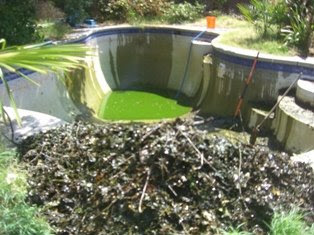 (I thought about bottling that green liquid at the bottom of the pool. Hey, I hear that consuming algae is all the health rage these days. And, yes, THAT pile of MUCK that is in the foreground was IN the pool prior to the mucking). Why it makes me happy - I honestly had nothing better to do today than to muck that pool. How good is that? To some of the judgemental sort, I can already hear, "get a life." My only answer is, "did you do something better than this today?" I ended up with the gratitude of my friend and a place to swim (soon).....and I got to get a little tan while I soaked up some Vitamin D to boot. Why it makes me happy - running errands is like HEAVEN on a NorCal day in the 70's. It's like your "to do" list can't be too long..........well, other than that pesky $4.50 a gallon for premium! 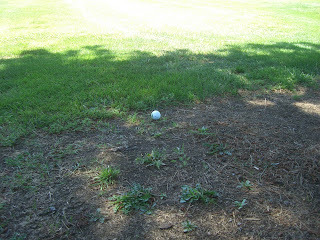 Why it makes me happy - I left a couple of wedges by the 18th green at a public golf course on Thursday. For those of you who don't understand that, wedges are highly desirable items for golfers to have. On a public course, you are not likely to ever run into the golfer who these clubs belonged to. In other words.....adios, wedgemigos! There were also a couple of teenagers playing in the group behind us. I will leave the stereotyping to you as to whether they are more or less likely to have turned my babies in than an adult. The fact is.....they turned them in. They looked like they were serious golfers....who may have seen that these were serious clubs. Who knows the real "why" behind it. The next time someone tells me that "no one ever turns lost clubs in at a public course," I know what I am going to say. Why it makes me happy - while not an abundance, I did a little harvesting today. First crop?....how can you be anything but happy? Why it makes me happy - my bro and sis-in-law insisted that I stay for dinner. Carrots for tri-tip? Nice trade! ....and a HappyUP!!!! Why it makes me happy - while it is a friend, there is more possibility there....it's not everyday that you think about the possibility of someone moving into that innermost circle. Why it makes me happy - the ol' Nutster Almanac says that rain on Memorial Day weekend means a very pleasant summer......just what I was looking for this year. Why it makes me happy - he's doing well....which was a little bit questionable. His welfare uplifted me. Why it makes me happy - it was great to spend some time with these guys......and keep my golf partners in check and up to date. The network keeps building. Why it makes me happy - my score was no HappyUP!!! but I am hitting some fabulous shots. I hit some punch shots from the trees that were incredible. I pured an 8-iron. I hit another perfect 8-iron. I hit a cut 3-wood from 230 within 10 ft with a strong cross breeze blowing....no one can hit a shot any better than that. This is why I play golf. You can go an entire round and not hit any of these shots. Now....I just have to get that putter squared away. Why it makes me happy - I have all of these contacts....I have people that are ready to make a move....I might as well put my skills to the benefit of someone. Who better than a friend. Why it makes me happy - had a touch of the insomnia last night. The afternoon afforded a nap opportunity so I took it. Wow.....now I am off quoting myself - what do you think about that? NO! That was a rhetorical question so zip it and stick to what the above means to you. ....yet, without the "unwanted disruption" - they would go out and create some more...it is all that they know. Do you know anyone like I am talking about? - what is up with that behavior? Why it makes me happy - my two admin staff love me and I love them. While working, I was not much of a lunch guy...I don't think we ever went to lunch. We had a lovely time. Why it makes me happy - one of my friends gave me a ride afterwork. When she dropped me off, I asked her to give me some ideas on how she thought my house should layout. She had some pretty good ideas. It's time to make things happen! Why it makes me happy - Toastmasters can be more than just a place to improve speaking. The club becomes a community of friends. While the member didn't totally breakdown, she almost did. It is at these times when we see a human side of people.......and can offer whatever it is that we can to help. The ultimate HappyUP!!! "Pleasure is only the shadow of happiness"
I would challenge you to spend some time conjuring upon that - and bring back to me what you find. Why it makes me happy - this person was just checking in on how I was doing since retiring. A lot of people are thinking this is going to be tougher on me than I think it actually is. It is good to be cared about. Why it makes me happy - I am not sure what direction this will go in. It is going to need some structure. This is one of those times that I think you must move forward.....even if you aren't exactly sure where the destination is. Why it makes me happy - to the faithful here, you know that my sleeping has been encumbered for the last 8 months or so. I can't count on it like I used to. Due to an electrical malfunction and 100 degree heat which has not cooled that much at night, I have thrown the futon pad in front of the screen door to find the coolest situation that I could. Miraculously, both nights I have done this have produced very pleasant slumber (except for the person wandering by singing "Hey Jude"........who the heck chooses "Hey Jude" as their nocturnal wanderings anthem anyway?" Why it makes me happy - it seems to have worked. The issue could have been as simple as my main breaker being a little loose. Plenty of AC on yet another 100 degree day here in the big tomato. It was also cool (no pun intended) to get my electrician out here on a Sunday. Why it happened - he was hungry? Why it makes me happy - he had just come from putting his dog down. We didn't talk about it much....but I know that he loved his puppy. He had the dog for over 13 years. Besides the dog, my friend and I never have a conversation that is uninteresting.....meaningless? Oh yeah...plenty of those. Entertaining? Always. I was doubled over in uncontrollable laughing mode at one point....always a HappyUP!!! Why it happened - I will be modest.......I'm GOOD! Why it makes me happy - my brother and I did not do well in our tournament. The dough brought in for "stuffin it" a couple of times took a little bit of the steam off of the loss. Plus, it feels good to have hit a couple of exceptional golf shots. Why it makes me happy - tonight, I will create some sort of adventure by not being able to live in my house.....it's 6:30 and probably still 100 degrees outside. For one night, it will be an adventure.........it could have been two nights but my electrician buddy is going to take care of me in the a.m.
Why it happened - I live one? Why it makes me happy - last night my power was out so it was sweltering.....but I McGyvered a solution to get some sleep. My bro and I didn't play well in our tournament...but had a good time. I then came home to another power outage that I thought was fixed this morning. It seems like this would be a bad day.......but, for whatever reason, I feel very lucky to be in a position that none of these things are big deals. These are luxurious problems to have and I am just feeling extremely grateful today. 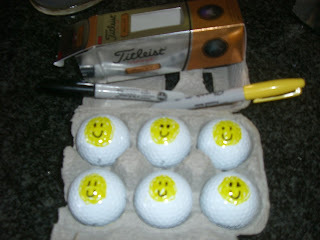 Why it makes me happy - today was round two of the Sunsetter Golf Tournament. My brother and I needed to make a move. I got us off on the right foot so we had the momentum going. It was a definite HappyUP!!! (at least while it was happening). Why it makes me happy - who would have suspected that, at a banquet-type dinner, we would be served one of the best dinner rolls that I have ever had in my life. I'm not kidding. This was PERFECT bread. Why it makes me happy - we had very enjoyable mealtime banter. One of my friends was tagging along with me. Dinner got over and we decided to take the long road back home and do some top down driving on a warm Spring evening. Did I say Spring? Technically, it is but it's been over 100 degs the last two days. Anyway, it was still a nice night to just go for a drive and continue chatting about life. <------This is not my ball - which could be a HappyUP!!! 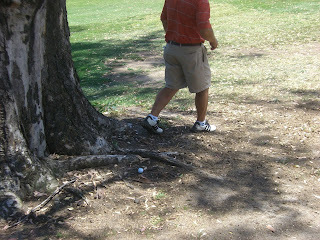 Unfortunately - it was my brother's ball and he is my partner. That's him...he's walking in the direction that he wants to hit the ball....he's right handed....it was a problem. Why it makes me happy - today was a struggle on the links. It was hot.....and windy. It was over 100 degrees. This is unseasonably warm in Sacramento. I haven't had an eagle in FOREVER. For you non-golfers - go ask a golfer what an eagle is and let them tell you if that would be a HappyUP!!! Why it makes me happy - the neighbor lady kittykorner across the street saw me outside and whipped over with some brownies. 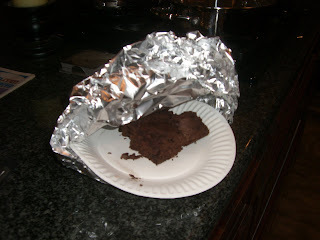 One.....just the gesture that someone is thinking of you to bring you brownies should be a HappyUP!!! Two......they are DANG good....and sans NUTS! I love female brownies! Moist...moist...moist. Why it makes me happy - while no major trader, all of you know that I like to do a little investing. Today, every single one of my stocks was up. In the long run, this daily phenomenon means nothing. In the framework of this blog, I got a little kick out of this. It was kind of like seeing a rainbow or a full moon. Why it makes me happy - it was great to sneak out to dinner. I hadn't had sushi in some time. Why it makes me happy - I hadn't gotten a chance to talk to him when I left the company. He had heard the story and he pretty much got the straight scoop.....which makes me happy. Why it makes me happy - I had the twin bed on the truck going to the dump. Then, I said, "hey, for the summer with no AC upstairs and a couple of 100 degree days coming up, why not get the sideroom setup as a basement downstairs?" The room isn't in total shape but the bed is made. Why it makes me happy - it won't take a lot more for me to get that basement in shape. I got my guitar cases moved down there where they belong. Why it makes me happy - I didn't realize my home laptop even had the right port for my wireless modem card. I called the peeps at Verizon. They hooked me up. Now, I will have the flexibility to move away from my printer which I rarely use. This is going to give me some nice flexibility.....both at home and on the road. Let me do a Public Service Announcement - and throw a plug in for one of my favorite sites on the internet thing. This site could be very important to you. Martin Seligman's Authentic Happiness - is a place that I go to about once a year. There are some excellent diagnostic tests that you can take to see where you are at in the grand scale of happiness. Best of all, they are FREE! FREE! FREE! I love it when something is FREE....but has tremendous value. It's probably not as important - to compare yourself to others. As a matter of fact, I really don't recommend it. Use the tests to give yourself a starting point. You can find out your Signature Strengths - just make sure you answer the questions how you really feel things are.....don't answer them with what you think are the "correct" answers. The correct ones are the honest ones. 5. Gratitude - which was number 15. I can see why this one has taken a leap up the scale. I am in a very enviable position in life now......and I fully know it and appreciate it. So, which strengths took a dive - over the last year and a half? Forgiveness - was my number 1. It now comes in at number 12. I believe I forgive......but I do not forget. This is something that is important to me. Perhaps I need to be cognizant of this and go out of my way to do a little extra forgiving. Other than that - my old numbers 4 and number 5 (creativity and fairness/justice) made a slight move to number 6 and 7. All in all - not a lot of change. It is an unbiased source putting something into words what many of us have trouble articulating....talking about ourselves. What does one take from that? - between the times of test 1 and 2, I started doing some work on myself in the area of Positive Psychology (this is not Positive Mental Attitude...it is the Science founded by Dr Seligman and based on his groundbreaking work that sent the psychological community on it's ear). Now, in the last 8 months, I was at battle with my employer until I finally had to terminate them from that position. My retirement has been something I knew would come - but it just came upon me recently. I LOVE the people that I was proud to serve...they were called my employees. This saddens me a bit right now. There is a vacuum that I am preparing to search a filling for. At the moment, I am marinating. There is nothing happening. I am used to things happening. I think it is natural that my Happiness Quotient has taken a little hit. The significant thing - is that, despite this major life event, I am still happier than when I started the process. "But Nutster, you are only in the 3's. The highest you have ever been in is the 3's. Shouldn't you be higher to be the HappyUP!!! guru?" - wow....you guys ask great questions. Tough....but fair. The answer is a resounding "No." Even Dr Seligman himself is not a high scorer. It's not about where you are on the scale.....it's all about doing the work to move up the scale. Some people have a higher and lower - natural disposition to happiness. As the founders of our country knew, happiness is a pursuit. ....like a daily discipline - hmmmm......can I think of any........wait a minute....it's coming to me......how about something like this? It could be just what the doctor, Dr Seligman, ordered. Obviously, I don't live under the thumb of a Homeowner's Association - because "they" don't go <------------for this kind of thing. There is one hoity toity HOA - near me that doesn't even allow you to have your garage door open for more than an hour or two. I don't think it would be much of a HappyUP!!! for me or the HOA if I lived there. That probably has something to do with why I don't. I am rather obstreperous - in that way. ...and my lawn got the water - instead of the gutter. No tire tracks left when done - it felt like the right thing to do. ....somehow, there is probably a Jeff Foxworthy joke in all of this - speaking of which, why do you think he is so popular? People need to make fun/belittle other people. By knocking others down, they feel that it elevates them. The "hoity's" probably love him for that. It's not my particular style -nor does it seem to be in keeping with the ways of the only Authority I answer to either. ...and why so the rednecks love Foxworthy? - They are what they are and are proud of it. They're making fun of the hoity's every time they laugh. To each his own - the only thing I care about is that I didn't waste any precious resources. HappyUP!!! Day 470...Welcome to Monday! <-------Hey, before we do today's HappyUP!!! installment, take a moment to take in my neighbor's flowers....absolutely brilliant!!! Why it makes me happy - he gave me some news that was pretty much along what I had planned.....and some valuable other insights that I need. Why it makes me happy - doesn't your car run better when it is clean? Why it makes me happy - I don't watch golf on TV.........except for the big tournaments. While the Players isn't one of the Majors, it is darn close. Today's event lived up to the billing. It was a great piece of drama that unfolded. Why it makes me happy - my sleeping patterns have changed. When I fall asleep easily and sleep all through the night, it's a HappyUP!!! Why it makes me happy - I have a tournament to play in this week. I picked up something today on TV that I had forgotten about. I went out to the backyard and gave it a try. Voila! One more step toward getting my confidence back. Why it makes me happy - first, I am a bit of a word freak. Second, when a word is found/created that takes something that you had to describe and defines it in one word, it's a quirky little HappyUP!!! for me. Today's word is quatopygia. Latin.....quatio means to shake. Greek....pyge means buttocks. "My, what an interesting quatopygia that woman has." See, it even sounds a lot nicer than what most guys say...or think. I think my mother would be proud of me today. Why it makes me happy - he was at a coffee house about 5 minutes from where I was at. I buzzed over and we kibitzed for an hour on a Saturday afternoon. 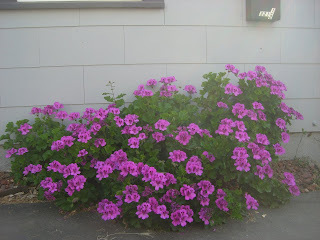 Why it makes me happy - my plants seemed to get off to a slow start this year. Who knows.....maybe it wasn't that slow....it just seemed that way. I think worrying is a part of the gardner's makeup.....and optimism too. The worries are being allayed. I saw my first pepper...and my first tomato....both develop this week. Everything will be all right. This was a significant week - it was the first week of my retirement....well, at least my first retirement. I figure if share can reserve the right to enjoy multiple retirement tours, I deserve the same thing. Plus, I'm not even 50 yet - there's a lot for me to do out there in this world.....and a lot of people that would really appreciate the unique talents that I bring to them. I may not be able to avoid working again...even if I want to. It has only been a week and people are crying for me to come back into the industry working for my competitors. 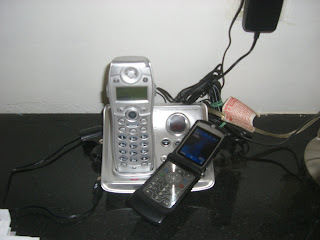 I had an interesting thing happen this week - involving the telephone. Over the 20+ years of being a hard charging business person, my golf game fell into extreme disrepair. I used to play competitively and had acquired a degree of talent. Over the last few years, it would have been hard to know that unless I told you. One of the things I am going to work on - in my retirement is to see how quickly I can get my game back to the level it once was. I am a lot older so that is a negative....BUT the technology of today has me hitting the ball a lot farther than I used to. I played a round during the week this week - and I had an epiphany. Even though I had a lot of Paid Time Off while working, I rarely played during the week. When I did, I would put my cell phone on "stun" mode. I would check during the round to see who was calling and try to ascertain whether they needed a call right back. For the first time in forever, I played the other day and didn't look at my phone at all. I also didn't finish the round - and rush to see the calls that I had missed and all of the e-mails that I was now behind on because I was "playing hookey." My first cell phone - was a transportable model. If you remember, these were about the size of a phonebook. They had a full size handpiece. I remember taking that to the golf course and throwing it into the cart. I got such a ration of crap that day, "leave the office at the office," or, "tell the commanding officer we need more ammunition out here on the front line, sergeant." ....but are they really THERE - on the golf course fully enjoying what the setting and the game can provide? Even if they are on the weekend taking personal calls, are they present? Which takes me a step deeper - where else do we take our cell phones and iPods and Blackberry's? Do they allow us to be more mobile?....or do they dilute the experiences that we can have "in the now" that take a little bit of more than casual attention to notice. Does the technology create a degree of mindlessness? And, because I am a thinker - I have to go to the next step. Take away the cell phone, the iPOD, the Blackberry. Would it make any difference? Would the void be filled with boredom or wonder for you? Why it makes me happy - I could have taken the route for a 50 minute drive. I took the hour and a half route with the top down......70 degrees.....trees.....foothill mountains....ahhhhhh. Why it makes me happy - this person was very important to me at the job that I left. Circumstances prevented us from talking off line. We ate outside and it was a great day for that. Why it makes me happy - I got off relatively cheap. I thought it would cost me 2.5 times what it did. How many times do you take your car in and come out of it for less than you thought? THAT is a definition of a HappyUP!!! You'd notice if it was 1.5 times more....appreciate it when it is less. 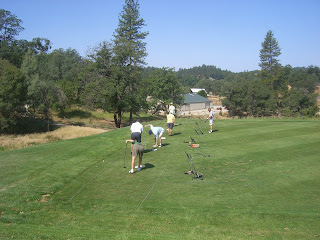 Why it made me happy - hey, I am in full on golf mode right now....if you have a tee time, I'm playing! Why it made me happy - once again, I played MUCH better than my score....and my score was better than my recent history. This is some very good trending. I seem to be regaining some of my form and confidence. Why it made me happy - I am able to help them and guide them through some tough times. I also think that part of them reaching out to me is to make sure that I am doing well. Their concern for me is very special. Why it makes me happy - I got him settled down and convinced that things will be fine. Why it made me happy - there was a point during our lunch on the Sacramento River with a slight breeze blowing as we overlooked the water when I said, "dude, do you realize that you could wander the entire planet right now.....and there is not a more perfect spot to be than we are sitting right now." Absolutely gorgeous. Why it made me happy - I have a junk room out back. It's probably not as scary as yours but there is plenty of clutter there. Rather than make it a project, I decided I would take 15 minutes of micro-movements and make some progress. I don't know what it is about clutter and I.....I just can't keep it out! I'll attack again tomorrow. Why it made me happy - I got some scoop as to what is going on at my former employer. HappyUP!!! - a vc mail from P.O. Why it made me happy - he thanked me for giving him the opportunity to provide for his family in a way that he didn't think possible. Whoa! HappyUP!!! - on going correspondence with P.S. Why it made me happy - he gave me some inspiration.....and a thought....that, when I put with the thought I had last week, gives me a project to work on that is going to be FUN!....and right up my alley. Why it made me happy - he left our company after transferring. He went into another line of work. He thought so much of me that, even though he is miles away, he said that he would tell someone in his organization to come looking for me if I wanted to enter his field. Wow!!!! I must have done something right when he was under my care. P's e-mail he sent to someone about me and to always take "the high road"
On going e-mail trades with P.S. Why it made me happy - it didn't really teach me anything....it just sent me a sign reinforcing what I already know. It's good to have reinforcement......and it came at the funniest of times. Why it makes me happy - do you know that feeling you get when you look...and look...and look...but you can't find that thing you are after? (If not, it happens to those of those that store "useful info" for later). Just when I was about to give up, I found it. Why it makes me happy - they were spelling out some things that I didn't see.....having one's vision cleared is always a HappyUP!!! Who the heck makes these rules? I am talking to a lady today - and she starts telling me about her white tile kitchen floor...and how hard it is to keep clean. I tell her - "that's why I went with a grey/silver/black pattern in my kitchen. While I wipe up spills and sweep, I must have gone a year before I got down on the hands and knees and did a scrub......and it will be another year before I do that again! You can't see the dirt." She replies - "but I wear white socks around the house." "Wear Black Socks!" 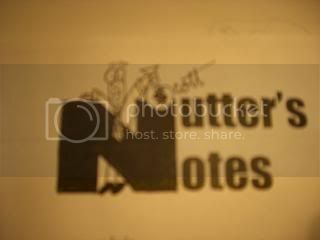 - which now got me to thinking......which is one of my favorite things to do. Who decided that it was cool to wear white socks - and it was goofy to wear black ones. Obviously, I am not talking about when you have to match things. I am talking about with shorts and such. Everyone makes jokes of the old tourists wearing those black socks. "What? Like it's not a joke if they are wearing white ones?" - take an objective look at this. Forget about the way things are "supposed to be." Look at this sock situation through a clear filter. Do black socks look any more ridiculous with a pair of shorts than white ones do? The answer is "No" - the reason that white socks appear cool and acceptable is that tennis shoes USED to be white. Doubt my answer? Go buy a pair of black athletic shoes (they are out there....I own more than one pair). White socks look as ridiculous with those and black socks do with white shoes. The other reason - is that they didn't used to make black athletic socks....or they weren't as easy to get as they are today. Now, go back to our lady friend with the white socks - SHE DOESN'T HAVE SHOES ON AROUND THE HOUSE! Yet, she is wearing the white socks. 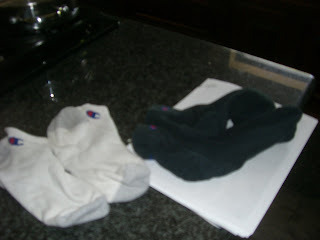 Practical hint for the day - wear BLACK socks when you are just wearing socks around the house. Bigger Thought - you see the moniker on the blog where it says, "a guy sojourning the same orb you are...with permission to look at it a little bit differently?" This is what I am talking about. Who made the white sock rule? Why was it made? Who is enforcing it that makes you conform to it? Don't non-conform just to non-conform. Do it because CONVENTION isn't always CONVENTIONAL for your situation. THINK! - for goodness sakes, do you know how hard it is to keep those white socks white. You'll end up destroying them with the bleach! Then....you have to get new socks sooner than if you had black socks. A little thought just saved you some dough! What's wrong with this picture? - you're right. Absolutely nothing. 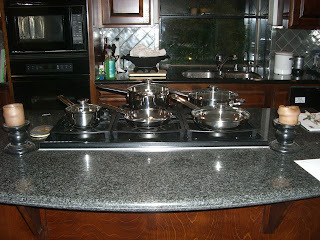 Yet, why is it that I never see - people storing their pots and pans on their stove? Perhaps it does happen - but shouldn't it be a constant if you have a matching set? This is my first set of matching cookware - and, as I was taking it out of the boxes, I went, "geez, I am going to have to find a place for all of this stuff." As I was unpacking the lids - I was going, "oh, and the lids." Don't you just love playing the jigsaw puzzle lid game in your pots and pan drawers? "Hmmmm...is it this lid that goes with that pot?" Doesn't it make all the sense in the world to store these like this? - am I crazy? Go ahead and say it, I'm used to it. I've been called out for it many times. It usually ends up being crazy like a fox. Voila!!! - nobody can see under the grates where the burners are with the Nutster Pot Storing method! Also - no more searching for the right pan....it's right there in front of you....right where you need it. What's up with this storage fetish that we have? - why have those racks hanging from the ceiling? I'm looking for the downside of this system. If you have some insight, let me know. Why it makes me happy - it was a perfect day. It was a little warm. Then, on the back 9, the weather got weird. Then, it got nice again. I couldn't think of a better way to spend an afternoon. Why it makes me happy - I'm still not scoring but I am getting my golf swing back. I am hitting a lot of pure shots. It is getting to where I am actually having confidence in my swing again. It's not that I am playing well. I re-discovered some fundamentals. I broke 80 and I threw 3 shots away in the last 4 holes. I three putted a couple of times. I bogeyed a couple of holes when all I had was a wedge in my hand. These are little rusty mistakes. Good times could be lying ahead. Why it makes me happy - there is NO WAY my life would be as good today if I hadn't made this lifestyle adjustment a half a decade ago. How Do You Mark Your Titleist? You have seen the ad campaign - if not, choose "kangaroo" when you go here. In reality - there is only one HappyUP!!! way to mark your titleist. 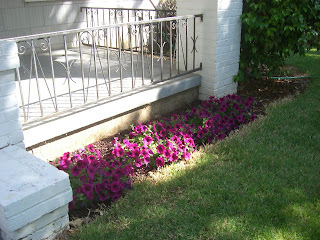 Why it makes me happy - I was a little concerned about the progress of some of the plants. They weren't looking so keen. They are looking much better this week. The peppers budded...it was the first time I saw that this year. Why it makes me happy - I wish, "yeah, baby," wasn't a cliche'. It's still shaggin amusing when Mike Meyers does that! Why it makes me happy - it was one of the best pieces that I ever sent. Why it made me happy - the visit with bro and sis-in-law was great....and then my niece showed up as she came home from college for the weekend so it was good to see her. Why it made me happy - this person has friends much closer than me. This person had a secret bottled up that could not be told to anyone else. The secret was as far away from a HappyUP!!! as you can get. It was a privilege for me to be that person in this individual's time of need.